A form of light therapy that utilizes non-ionizing forms of light sources, including lasers, LEDS, and broadband light, in the visible and infrared spectrum. It is a nonthermal process involving endogenous chromophores eliciting photophysical (i.e., linear and nonlinear) and photochemical events at various biological scales. This process results in beneficial therapeutic outcomes including alleviation of pain or inflammation, immunomodulation, and promotion of wound healing and tissue regeneration. 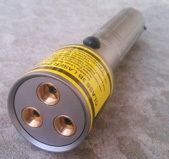 The three diode infrared Class 3B laser (808nm/300mW) penetrates up to 2 inches and is ideal for helping deep tissues such as tendons, muscles, and joints. 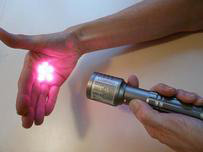 The six diode Red laser( 650nm/5mW) penetrates 1 cm and is recommended for helping superficial wounds, cuts, and can be used for quick pain control since it reduces inflammation over nerve endings.